Unlock performance and aural pleasure from your NSX with the ScienceofSpeed Sport Downpipe System! The factory downpipe assemblies (the components joining the turbochargers and muffler) are restrictive. 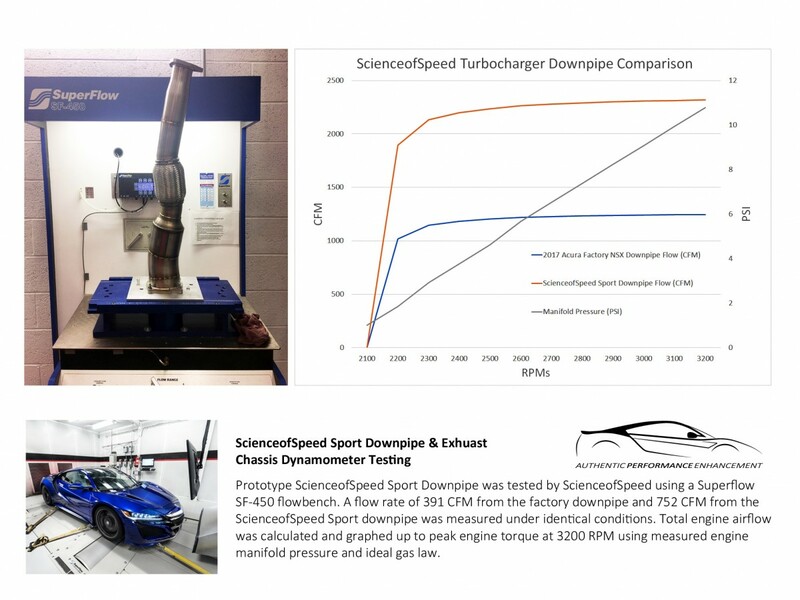 By 3D CAD scanning the factory assembly, ScienceofSpeed was able to optimize the design for increased flow and eliminate the accoustic obstructions that limit the tone and turbocharger sounds from the factory exhaust system. To begin development, the factory assembly was 3D scanned. This allowed certain features like the multi-dimensional inlet flange to be replicated. Scanning and fixturing has also allowed all four factory heat shields (front and rear set) to be retained with built in bracketry that supports the shields and uses the factory hardware. Retaining all four heat shields is critically important due to the close proximity of exhaust components to the chassis. The ScienceofSpeed Sport Downpipe System utilizes a catalytic converter designed for high temperature turbocharged applications. The converter set is rated to flow over 170 lb/min of air mass. 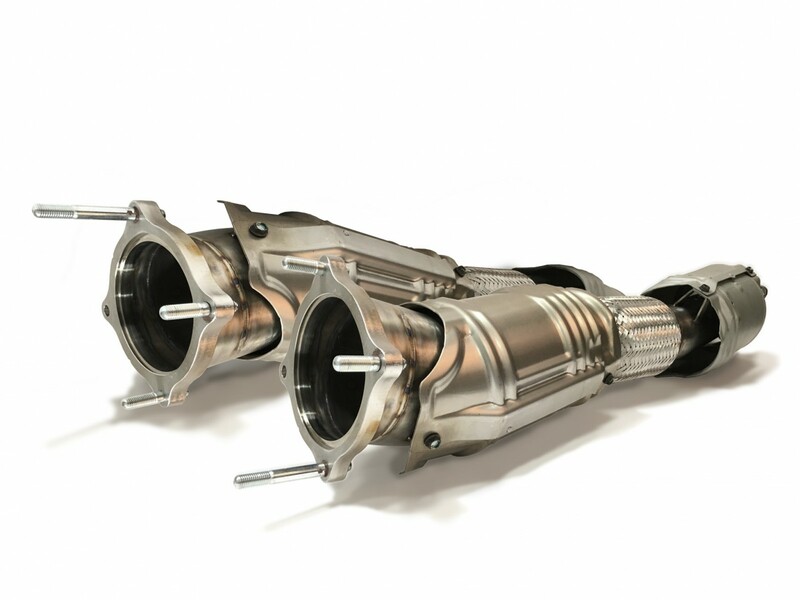 Compared to the factory converter set, the converters have a larger cross section, less restrictive substrate design, a braised and captivated core, and a higher precision metal wash density for improved emissions performance. The downpipe assembly is fully constructed from stainless steel, including machined flanges, and USA manufactured stainless steel tubing and converters. Prototypes were first measured against factory downpipes to verify improved flow performance. The assemblies were tested on a Superflow flow bench using a custom made adapter. At maximum flow bench flow, the ScienceofSpeed Downpipe System improved flow by 126%. 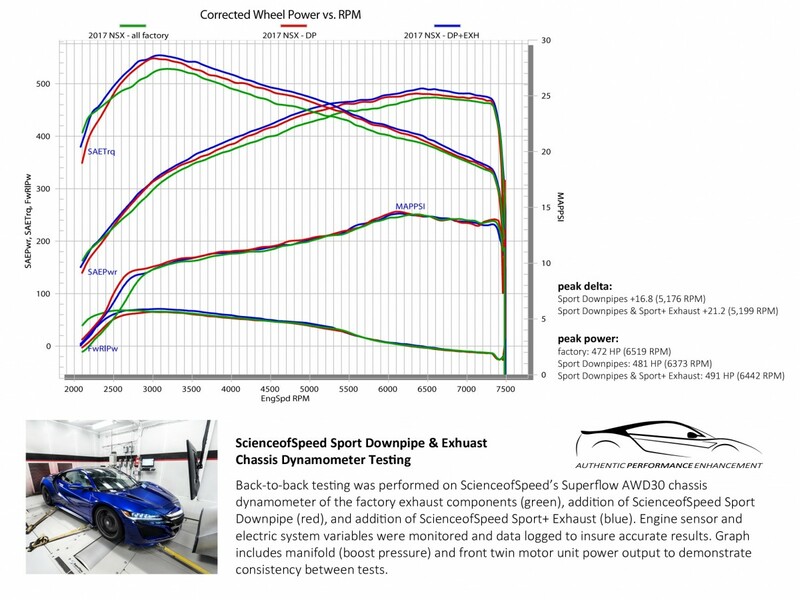 Downpipes were then tested on the ScienceofSpeed Superflow chassis dynamometer. Pronounced deep exhaust note & turbocharger sound. Compatible with either factory exhaust or aftermarket exhausts such as ScienceofSpeed Sport & Sport+ Exhausts. Compatible with factory mode selector switch (to switch between Sport, Sport+ & Track modes). High performance downpipes increase flow by 192% over factory. 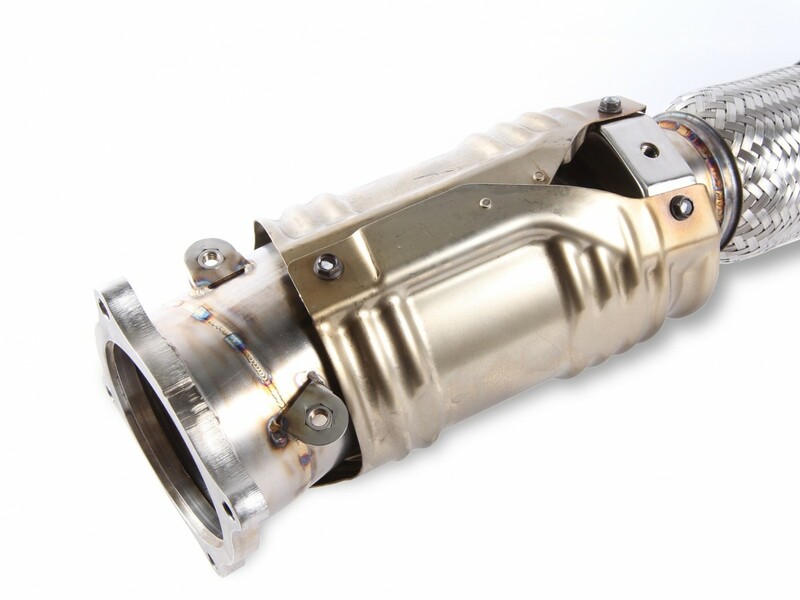 EPA certified high performance catalytic converters for turbocharged applications. Full stainless steel construction & precision back-purged TIG welding. Retains all five factory heat shields that attach to downpipe assembly. Detailed, step-by-step instructions with photos and installation video.